Cisco Catalyst 2960-X and -XR Series Switches earned the Miercom Certified Green Award for saving over 50% in annual energy operating costs compared to the industry average. The switches were evaluated in accordance with the Miercom Certified Green Testing Methodology. Saved over 50% in annual energy operating costs compared to the industry average. Consumed 55% less energy in Watts/Gbps than the industry average. 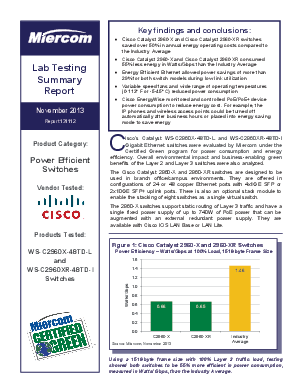 Achieved power savings of more than 29% during low link utilization with Energy Efficient Ethernet.